Memorials remind us of loved ones and the importance of their lives. 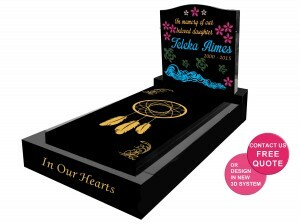 You can choose it’s slab material to cover the grave site and can also incorporate a headstone or plaque into it. Some of the materials used for memorials are stainless steel, marble and granite. 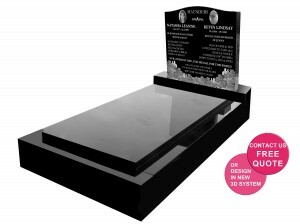 You can design a memorial using similar materials for its headstone and slab or combine two types like having a light transmitting headstone on a stainless steel memorial or a coloured granite headstone on a granite memorial. The exposed material surrounding the grave perimeter is the kerb which is made of solid granite, stainless steel, sandstone, marble or any strong material. Sometimes it may be concrete with a thin granite, marble or sandstone layer. We however recommend solid granite for its longevity, beauty and low maintenance. While kerbs are usually mounted on a concrete footing or foundation which can’t be seen, some cemeteries insist that its reinforced steel concrete bored piers foundation should reach the grave’s depth. If the cemetery permits, you can grow a garden in the kerbs’ confines. This is a full slab of material installed on the kerbing to cover the grave opening. While it is usually made of at least 50 mm thick solid granite, it can also be of concrete, sandstone, stainless steel, marble or some strong material. It can be made joining smaller panels together, but should be self-supporting. Headstones carry the inscription and are mounted on the ledger panel. The inscription can be sand blasted directly into the ledger face, laser etched, provided as a plaque attached to the ledger panel or mounted on a stand attached the ledger panel or kerb. We can laser etch your chosen text, images and motifs on 2400mm x 1200mm black granite. Some memorials have optional cubes in various styles, anywhere on it, even on the headstone base. 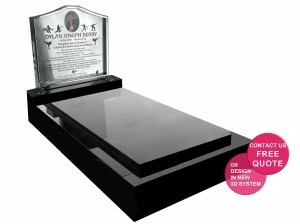 While standard shaped and styled headstones or plaques are always available, you can also design your own using the exclusive design section of our website. 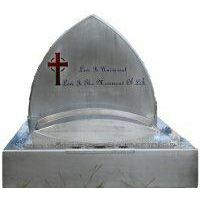 However as memorials are built based on different variables, please contact us directly or email us to help you with your customization. It is possible to have your full memorial installed in most Australian cemeteries. 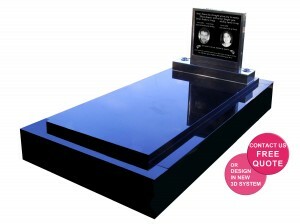 Black granite headstone with laser-etched inscriptions, photos and motifs. Many other options including photo overlays. 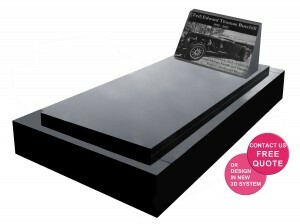 Black granite block headstone with laser-etched inscriptions, photos and motifs. Many other options including photo overlays. Carved, coloured granite headstone with coloured standard inscription. Many other options including motifs and photo overlays.